NEC’s legendary reliability and quality standards are evident in the innovative DS1000/2000 32-bit architecture. installation investment in common equipment intact. and 64 ports. It is easily expandable to 8 slots and 112 ports by upgrading to a 8 slot cabinet. simplified one-pair wiring mean your initial installation and future add-ons can be quick and economical. a built-in interface for a door answer box. Interactive “Soft” Keys on display telephones. person that left you a voice mail as easily as pressing one key. Direct Inward Dialing (DID) or E&M Tie Line signaling. continue to have phone programming so Moves, Adds and Changes can be handled quickly. NEC’s legendary reliability and quality standards are evident with the introduction of the new, fully integrated, flash memory based IntraMail voice mail systems for use with either a DS1000 or DS2000 system. 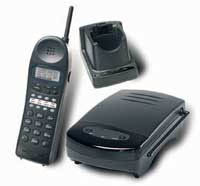 IntraMail is available in two different sizes for your voice mail needs: a 4 port/ 4 hour system, or an 8 port/8 hour system. 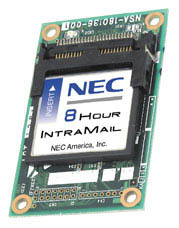 IntraMail builds on NEC’s base of experience with voice mail systems to offer a sophisticated yet easy-to-use feature set that enhances ease-of-use in its voice mail predecessors. IntraMail brings a new level of speed and simplicity to the features you’ve come to expect from an NEC voice mail system. Full integration means that IntraMail installs inside the DS1000 or DS2000 common equipment, does not require the optional expense of analog station ports for connection to the system and does not require a separate power supply. Also, IntraMail will show you the number of messages in your mail box as soon as you enter your mailbox, and will flash a message waiting lamp on your phone when you have a new message. One of the most useful aspects of this full integration is the interactive “soft” keys shown on display telephones which let you manage your voice mail without having to remember dialing codes. For example, to exit your mailbox after you’ve listened to your messages, simply press the softkey that says “EXIT”. Busy offices can always keep pace with productivity features like Caller ID with Return Call. Since the Caller ID number is associated with the voice mail message (if Caller ID is supplied by your local telephone company), it makes returning calls to people who have left messages in your voice mail mailbox that much easier. Fax detection can save you even more money. Now there’s no necessity for a separate line for your fax machine. IntraMail can listen for a fax tone on an incoming call, and if it hears a fax tone it will automatically transfer the call to the extension where your fax machine is installed. If you’ve ever had calls during which you can’t take notes fast enough, or had the necessity to record important information so it can be reviewed later, the IntraMail has the solution for you. Conversation Record lets you record a conversation into your mailbox, review that conversation later and forward it to another extension after your review. These are just a few of the ways that IntraMail and the DS1000 and DS2000 systems can save you time and money. Contact your local NEC dealer for more information. With the NEC Cordless product line, the distance of your handset cord does not govern your work area. The mobility, convenience and reliability of these cost-effective telephones empower employees to answer calls regardless of their location. Potential customers do not waste time playing telephone tag, and employees are not glued to their desk waiting for that all-important call. Business is not lost because of callers being able to reach a live person. The NEC Cordless application is the ideal solution for those businesses that require mobility but do not want to invest in a full-blown wireless solution. 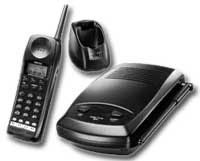 Dterm Headset Cordless - The analog Dterm Headset Cordless telephone is designed for mobility. Its convenient pocket size allows you to speak and listen in a handsfree mode. Designed and engineered using the 2.4 GHz frequency range, the Dterm Headset Cordless provides clear and secure conversations. The extremely small "handset" measures just 2.13 x 0.61 x 3.39 inches. For added value, the unit comes equipped with two 2.5 mm headsets. In addition, the Dterm Headset Cordless offers such features as a 100-number phone book, a 3-line, 16-character backlit handset display, one-touch dialing and vibration alert mode. With its flexible, unique design and rich feature set, NEC's new hands-free cordless headset is a powerful executive business terminal. Dterm Cordless II - Designed for employees who need digital multiline desktop functionality in a cordless handset. The 2x16 line display provides valuable calling information. The Dterm Cordless II is designed to eliminate noise and provides a range of up to 350 feet. Dterm Cordless Lite II - Designed for employees who need digital multiline desktop functionality in a cordless handset. The 2x16 line display provides valuable calling information. The Dterm Cordless Lite is designed to eliminate noise and provides a range of up to 150 feet. The Dterm Cordless Lite is ideal when the range of the Dterm Cordless II is not required.